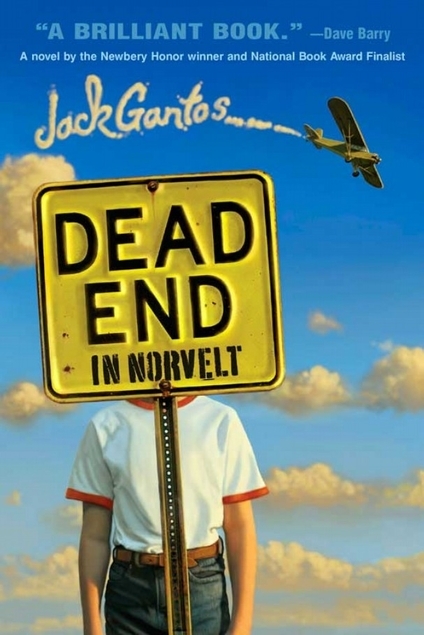 In the tiny town of Norvelt, young Jack is looking forward to a summer of baseball, trips to the movies and other fun, until one bad decision and one wild injustice (more on that later) gets him grounded until school starts. He’s only allowed out to help elderly Miss Volker write obituaries…which comes up surprisingly often as a string of old women start dying. I wanted to like this more than I did. An ordinary kid surrounded by slightly kooky characters in a small town sounds great! Dollops of history as Miss Volker looks to the past to expound on ideals of freedom and community, plus a hint of a murder mystery. What’s not to like? Well, a few things. I never loved Jack; I don’t know why, I just didn’t. Usually I like kids who get a bad rap from adults, especially if they like to read, but somehow this one didn’t work for me. Maybe Jack liked to read a little too much about bloody history, harder to relate to than a Star Wars fandom. I hate (hate) to classify books as boy books or girl books, but this one did seem to be aimed at a certain age of boy, when blood and guts are so cool. That wasn’t a big part of the story, but it was an element. Personally, I could have lived without Jack’s perpetual bloody nose, or his love of war movies. I was also really bothered by one of the central plot points; namely, that wild injustice mentioned above. Jack is grounded for a couple reasons, but the big one was because he mowed down his mother’s cornfield because his father ordered him to. So–his father says do it, his mother says don’t, and when he does, his mother grounds him. I was just really, deeply bothered that his parents put him in that impossible situation to begin, and equally bothered that he was then punished for not somehow getting out of said-impossible situation. And maybe I was also bothered that the book didn’t seem to grasp the unfairness. Like I said above, usually a kid being treated unfairly gets my sympathy, but this one just made me angry. Last, and this is a very writer thing, I thought the book’s pacing was off. It meanders along through the summer for probably three-quarters of the book, and then suddenly notices there’s probably a serial killer in town and Jack should try to do something about it. The most engaging part of the story, then, gets crammed into the end. So, issues. But on the other hand, I feel like they were largely personal to me, and might not bother someone else! Eleven year old Marty lives on the outskirts of a tiny town in West Virginia. 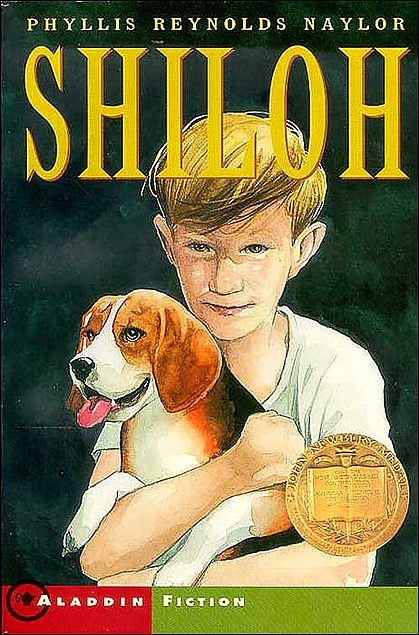 He finds a young beagle out in the hills, and suspects he’s being abused by his owner, mean-spirited neighbor Judd. Marty bonds with the dog, naming him Shiloh, and can’t bear to return him; instead he hides him away, forcing himself into an ever more complicated web of lies and deceptions. Unlike the last one, this book was better than I thought it would be. I expected a boy-and-his-dog story (which it was) and I expected the dog would inevitably die at the end (he didn’t!) but I didn’t expect the subtle complexity of the characters or the issues raised. I liked Marty a lot–and just as an aside, isn’t it funny the characters we do and don’t like? Sometimes I know why, but often it’s just like real people. Some you connect with, some you don’t. Anyway–Marty is thoughtful, good-hearted and a bit of a loner. He wants to do what’s right, and when he gets into conflicting places he struggles with what to do. Is it right to hide a man’s dog and lie to his parents? Is it right to return a dog to someone who’ll hurt him? This strikes me as an ethical coming of age story. Marty doesn’t discover new confidence or claim his identity or the things that often happen in coming of age stories (at least, not overtly), but he does grow in his thinking about right and wrong, about loyalty, and about how he regards others. He also questions his society’s judgments, and makes some decisions on what he himself believes. Naylor also gave a hint of sympathy to Judd that surprised me. I mean, the man abuses his dogs! But we learn that Judd’s father hit him when he was a kid, and that Judd’s treatment of his animals isn’t entirely black-and-white cruel. Marty and the reader both come to see that Judd, while not a nice man, isn’t a cardboard evil villain either. This one comes in as one of the better Newberys this year, and a pleasant surprise! I probably wouldn’t read the first one, but the second one sounds good, especially since you said the dog DOESN’T die. Great reviews.